This year gamers have to decide who gets their dollars (unless you’re me and you just buy both—jealous?). Early adopters will have to pick between Sony’s $399 Playstation 4 (PS4) and Microsoft’s $499 Xbox One. In this post and my next, I’m going to break down my first 48 hours with each to help you decide which system to rush out and buy. First up: the PS4. People all over Canada and the United States lined up for the console’s midnight release on November 15th. In 24 hours Sony sold more than one million PS4’s in North America alone. According to this article on theverge.com that makes it Sony’s fastest-selling console ever! I was able to purchase one of the coveted launch day systems and I didn’t have to brave the freezing, cold Wisconsin night air or pre-order. Instead, I went to Target at 8 a.m. on launch day and waited inside their lovely climate controlled store. Unlike other retailers, Target (at least in my area) did not have a midnight launch for Sony’s latest console. Instead, they opened up at their normal time. 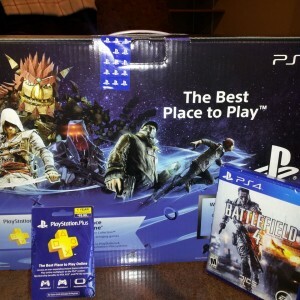 I ended up purchasing a PS4, a copy of Battlefield 4 (BF4) and a one year subscription to PlayStation+ (PS+), Sony’s online gaming network. I didn’t start hooking up my PS4 until 7:30 p.m. or 8 p.m. Friday night. I had to finish my work day and then I had chores to do around the house. That’s the price of home ownership, kids! Not only did I get a late start but, the setup took forever! Now, part of this was my fault because I decided to re-arrange my component shelf to make space for my PS4 and Xbox One. The physical hookup was quick. I just had to plug in the power cord and connect the HDMI cable to my AV receiver. Downloading the PS4’s massive 300MB, 1.5 system update, is what took an eternity! However, it did unlock many crucial system features like remote play, social media sharing and play as you download. If you're getting a network error on the PS4, please sit tight. As you can imagine, we're seeing heavy traffic tonight! According to this article on Arctechnica, Sony eventually took their entire network down for maintenance on the evening of the 15th. It was restored later that same night. If you’re just now getting your hands on the PS4 I wouldn’t anticipate the same issues. But the 1.5 update is still chunky, so be patient while downloading it (I also had to download update 1.51 which came out earlier this week. That was 323MB. It zipped along pretty quickly. It only took about 8 minutes.). I finally popped in BF4 around 9 p.m. Why did I buy BF4? The same reason as just about everyone else—online play! Unfortunately, BF4 was also having issues during launch weekend. I think the PS4 shows a lot of promise. I personally feel its graphical capabilities far surpass what I was expecting for this new console cycle. The redesigned controller, the Dualshock 4 (pictured left), is also intriguing. I can’t wait to see what developers do with the touch pad technology. Social sharing is simple. Anyone can share a screen shot on Twitter of Facebook with just a click of the share button. The voice control is adequate, although not as robust as what’s been shown with the Xbox One. However, the PS4 doesn’t have many exclusive titles at launch and their catalog of games is wholly underwhelming. Considering the issues I experienced on launch weekend and some of the issues gamers across North America are continuing to deal with (Blue Light of Death) I would suggest holding off for now on the PS4.